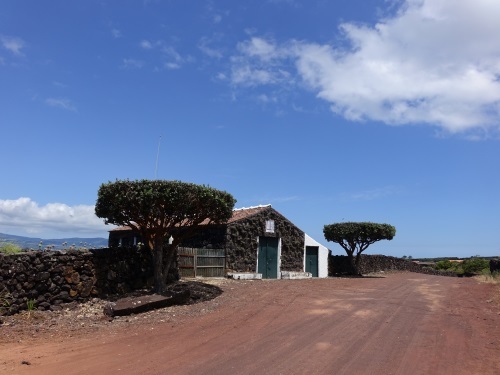 The Landscape of the Pico Island Vineyard Culture is the result of the agriculture practice of viniculture on a small volcanic island since the 15th century. The nominated area of 987 ha comprises of two thin coastal strips of growing vines in small soiless stonewalled fields on flat land along the coast unsuitable for arable cultivation. Pico Island is the second largest island of the Azores. Within the nominated Criação Velha area, traditional winegrowing continues, producing a sweet wine called Verdelho. Out of the 9 main islands of the Azores, Pico Island may be the prettiest one. Its lush green flora strongly contrasts with the abundant black lava stone that is present along its coasts. Its iconic stratovolcano peak is a landmark in the Azores part of the Atlantic Ocean. 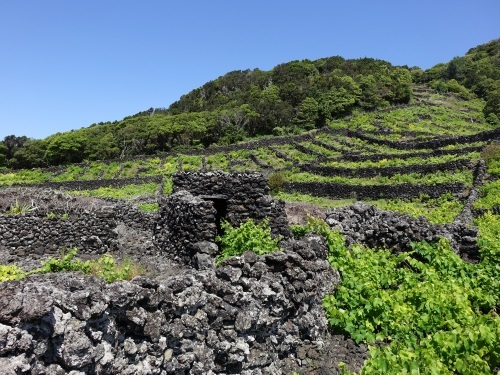 And there’s a WHS as well: the Vineyard Landscape of Pico Island comprises two narrow strips of land along the coast, where grapes are grown on a bottom of solid lava. Within stone fences, grapes were traditionally grown between the rocks of the lava stone - without soil. This part of Pico was unsuitable for ordinary farming. The northern part of this WHS lies right next to the airport of Pico, so it’s a really nice welcome when you fly in. The plots neatly divided by walls of basaltic blocks are a memorable sight. I stayed for 3 nights near the other stretch of vineyards though, at Madalena. There’s a great walk through the WHS landscape that you can do in that area. It starts in Porto Calhau. I did not rent a car on Pico (also not on Terceira), and got around easily by hiking, one-way taxi rides and the occasional public bus. To get to Porto Calhau I took a taxi. The driver was very much aware about the starting point of the hike, it’s very popular and well-signposted. The walk starts on the paved road along the coast. It's a minor road, I encountered little traffic except for some day trippers who were not deterred by the sharp rocks to swim in the sea or lay down on the rocks sunbathing. The hiking route is 6.9 kilometres long and takes 2 hours. It is fairly flat (an uncommon pleasure at the Azores), only after a kilometre or so you have to do a half-loop around a hill where the road goes up and down. In this zone there is a lot of Azorean heather, and I noticed the first plants in lots separated by walls of loose stones. That way they suffer less from the influence of sea and wind. After tackling the hill, one arrives at an enormous open plain. It is full of gray stonewalled fields (currais) in which the vines lie. There is no shelter here, at least not for hikers. Although there was a nice breeze, I felt the sun gradually starting to burn my face, arms and calves. I wonder how tough it will be when it is your job to pick the grapes here. Huts made of loose stone are available now and then to protect the farmers and the pickers. Unfortunately for the hikers, I found the entrance gates to them closed. Turning off from the paved road, the trail continues on a gravel road first and later on a narrow stone path through the 'fields'. I did not meet any other hikers, nor farmers - I wonder what the right season is, but I did not find any grapes on the plants that I saw. At the end of the walk you will approach a bright red windmill, a fairly new construction built after a traditional model. After that it's only a short walk to the village of Madalena. Conveniently the trail ends at a seafood restaurant. At only 20 ‘ticks’ from our community members, this is still a quite obscure WHS at the same level of difficulty as Mausoleum of Khoja Ahmed Yasawi , Caral Supe or the Pyu Ancient Cities. I enjoyed my 3 days on Pico, although like the rest of the Azores it is a bit sedate and old-fashioned. Good if you’re looking for some quiet days, less so if you’re an avid traveller that wants to see and do something different every day. I visited this WHS in October 2015. This is undoubtedly my favourite vineyard culture WHS so far and I have visited quite a few. It's unique as the vines literally grow on volcanic rock and are pretty much the only thing that can be grown by man on this remote volcanic island. To reach Pico, I flew from Lisbon to Sao Miguel Island and then from Sao Miguel Island to Pico Island. The airport is the closest building/structure to the inscribed area which can be divided in 3 areas. 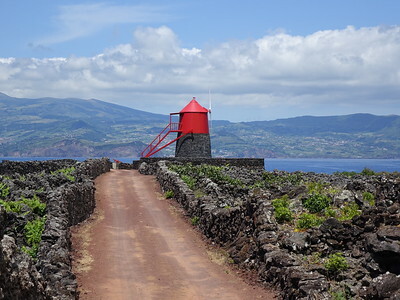 The Criacao Velha is right between the Pico volcano and the Atlantic coast just opposite of Faial Island. This is where there are most black basalt walls arranged in the so-called currais that help protect the vines from the ocean. The currais form a network of small squarish or semicircular plots for wine-growing. The vineyards that are subdivided by double walls with a height of not more than 1 metre, with intermediate portals, are called jaroes. The best way to visit is by walking the Vinhas da Criacao Velha trail which passes through the inscribed area and ends by the lava coast. Around Candelaria, is the second part of the inscribed area where you can see the so-called canadas. These are volcanic vineyards with a larger surface area and mostly with less rock than in Criacao. Most canadas are subdivided into currais and traverses which prevent wind piping and several of them reach very close to the sea shore. Nearby there is the Pico Wine Museum which is housed in the former Carmelite convent and where you can taste some Pico wine. My favourite were the aptly named red wine of Basalto and the white wine of Curral Atlantis. If you visit on Sundays, the entrance is free. The third and final inscribed area is towards the Northwestern part of the island of Pico, near the capital Madalena to an area known as Bandeiras. 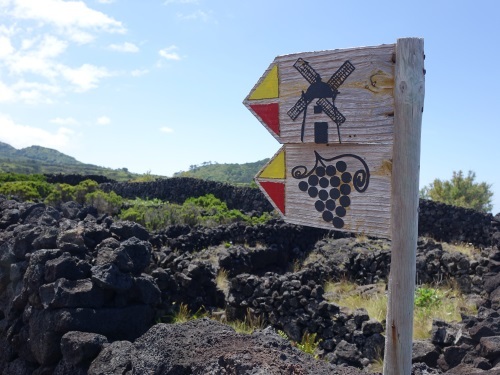 Here there are more vineyards with black stone walls, tidal wells, rilheiras or ox-cart ruts over lava slabs from former wine transportation methods, as wells as rola-pipas or ramps carved in volcanic stone to facilitate the transport of wine barrels to the port. Near Bandeiras, it's worthwhile visiting the Vineyard Culture Interpretation Centre which costs 7 euros and is highly informative with cellars, distilleries, warehouses, manorial homes, shelters and a quaint chapel. There are 3 reconstructed mills on the island of Pico: one in Criacao Velha, one near Sao Joao and another near Madalena. Having a rental car is a must in Pico and really worth it as the world heritage site is just the cherry on the cake really of what the island has to offer. I spent 3 incredible days on Pico Island and if I visit the Azores again I would certainly love to spend a week again in Pico which is the second largest island of the archipelago. The vegetation on the island is almost pristine with less than 5000 people living there. There are great hiking trails and fantastic birdwatching opportunities with several endemic species (such as the Western Azores Goldcrest). Last but certainly not least, there 27 species of cetaceans have been spotted so far off the coast of Pico island including the Blue Whale. I was very lucky to experience a pod of 8 sperm whales socialising and one of them dived just in front of our zodiac, fluking its enormous tail. We observed for more than an hour before spotting 2 species of dolphins: a solitary short-beaked dolphin and a score of bottlenose dolphins which escorted us back to the harbour of Lajes. Truly magical! I visited Pico in July 2014. Pico is an island part of the Acores archipelago, lying in the midway in the Atlantic, some 1500 km from mainland Portugal. Getting there however is rather easy, from Lisbon, with a long stopover on Terceira Island. Plane tickets are relatively afordable considering the distance. The stopover on Terceira island is long enough to get to Angro de Herismo site and to Algar do Carvao cave, which is on the TL. The WH site is a very small part of Pico island, clusterd on the western end. It consists mostly of small walled fields forming huge networks along the coast. The wall are made of black basalt stones protecting the crops from the strong Atlantic winds and from salt sprays. 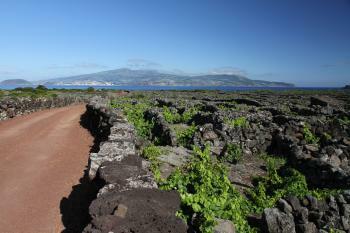 There is no soil, and vine crops are inserted directly into the cracks of the volcanic rocks. Some building, villages and ports are found around those fields and are part of the WHS. Scenary is magnificient, lying between sea and the Pico volcanic peak in the background. Faial island lies across the sea in the west. 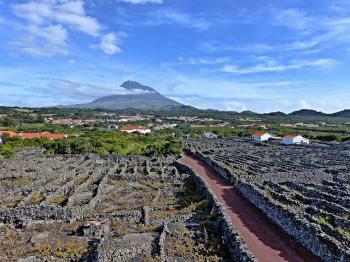 Cultural sites rejected for Natural criteria: Portugal's Pico Island was initially submitted as a mixed site in 2003, before being revised and nominated as a cultural landscape in 2004.